I Love, Love, LOVE this book! It is one of my favourites. The hardcover edition came out last year and I've been waiting patiently for the paperback to come out so I could grab a copy. And it's finally happened! Versatile Techniques & Diverse Projects for Painted Paper. Creating repeating patterns, freeform designs, customized stencil motifs, translucent looks, and waxed finishes are just a few of the remarkable painted paper effects that you can learn from a a master at the craft. Nine beautiful projects - from a Woven Accordion Book to a Shikishi & Holder - provide wonderful opportunities to practice and present your work. I must confess, the reason I love this book is the wonderful techniques for painting your paper it showcases. The instructions are really easy to follow, even for someone who's not very artistic like me. Mr.P works in a printing press so I have access to the ends of rolls of paper, which are perfect for heaps of things, and my plan is to use some of the techniques from this book to create my own Christmas wrapping paper. I still need to source some brushes and inks and something called 'gesso' to create some of the paint effects but that shouldn't be too hard as there are lots of art supplies stores around. 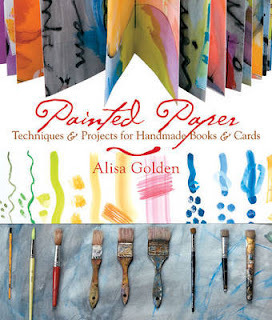 If you love creating your own books and cards, or would just like to learn some new techniques for painting on paper, then I highly recommend this book. You won't be disappointed (well, I don't think you will!) This would also make a perfect gift for anyone who is really artsy-crafty. If you'd like to grab a copy you can order one through www.candobooks.com.au, the RRP is $29.99 and it will be available from November. The hardcover edition is also still available and it's in stock now for RRP of $39.99.